Friends of the Soldiers Home solidified its partnership with Nam Knights Capital Chapter in a festive celebration with residents of the Armed Forces Retirement Home-Washington on the evening of Tuesday, Aug. 29. Dozens of residents gathered for food, drink, music and joke telling in the large community room of the Scott Building on the AFRH-Washington campus. 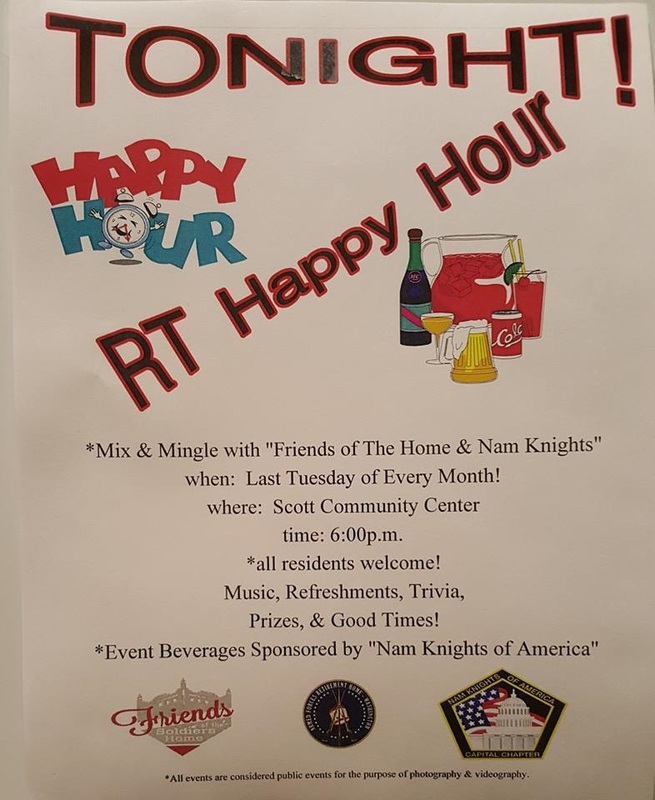 Nam Knights brings in the drinks for the celebration and join FOSH volunteers in mingling and serving treats to the veterans. AFRH staffer Carol Mitchell leads the joke telling while AFRH resident Ray plays the tunes. The monthly event, called Happy Hour, happens the last Tuesday evening of each month. If you would like to be part of the fun, write FOSH Volunteer Coordinator Lori Lincoln at volunteerfriendsofsoldiers(at)gmail(dot)com. This is an outstanding way to connect with many great men and women who served the country and now live in Washington, D.C. Photos courtesy of Pete Rauner of the Nam Knights. From L-R that’s Liz Cocke, Friends of the Soldiers Home VP; Pete Rauner, who leads Nam Knights Capital Chapter, and Carol Mitchell of AFRH. Peter Rauner of Nam Knights with FOSH volunteer Stella Henderson, left, and Lori Lincoln, Friends of the Soldiers Home Volunteer Coordinator.